Happy New Year...HERE'S THE PARTY! Three hundred and sixty-six days ago, The Militant wandered the streets of Downtown Los Angeles in search of a place to celebrate the end of 2012 and the start of 2013. He opted for Grand Park, which opened that summer to much fanfare, and waited for the big celebration to happen. 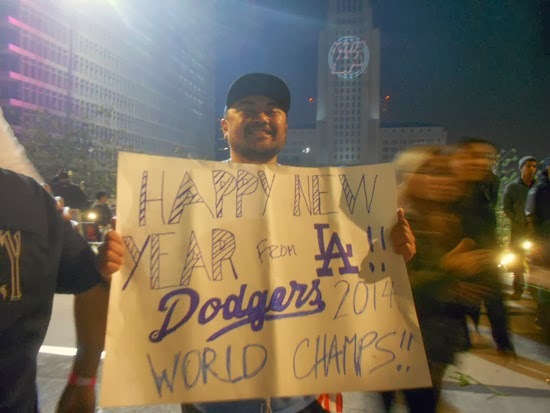 He challenged the Grand Park Grand-Poobahs to plan a New Year's Eve celebration a year later or else. So when he wandered onto the park one early December noon, he saw a cryptic poster that read, "NYE LA," which either meant A Certain Science Guy Named Bill was either going to do a lecture, or a dance routine (or both), or that The Militant's year-long wish had finally come true. Time to update the business cards: The Militant Angeleno: Blogger. Historian...Prophet. It's finally time to par-tay. BOOM! No more empty wasteland! The Militant already felt it when he hopped on board his (M) Red or Purple Line train, which was still before the 9 p.m. freebie fare gate unlocking unlatching period -- The Militant didn't want to get there too late. On board the train, people were already feeling festive, some wore party hats, while others started whooping on the train even before it had even pulled into Downtown. A few folks got out at 7th/Metro Center, partaking in the private parties at L.A. Live and the 7th Street corridor. A few folks got off at Pershing Square. But the train unloaded once it hit Civic Center. The Militant got disoriented or a second, surrounded by chain link fencing once he got up to street level, but soon found out we all had to walk north to Temple and make a U-turn through Hill Street to the proper entrances. Once in, the bevy of mobile gourmet vending vehicles and their associated lines made it known that Los Angeles is still the undisputed food truck capital of the universe. Already people felt relaxed and excited, if not for the promise of renewal from the change of the calendar, then for the opportunity to finally gather in a public space to usher in MMXIV with thousands of other Angelenos. A group of people were gathered at the Court of Flags to watch the NYC Times Square Ball Drop projected on the Hall of Records building at 9 p.m., something that would usually annoy The Militant, but the mood in the cold winter air was so upbeat, he didn't care. Later, the same wall projected a list of Los Angeles County cities (and Los Angeles City communities), which made The Militant smile. He also ran into a few Operatives along the way, who joined him at various times, checking out the main stage below City Hall, the "L.A." photo-op letter balloons, the rather creative "2014" hanging sphere structure and watching grown adults traipse onto the Arthur Will Memorial Fountain's water court for a change. 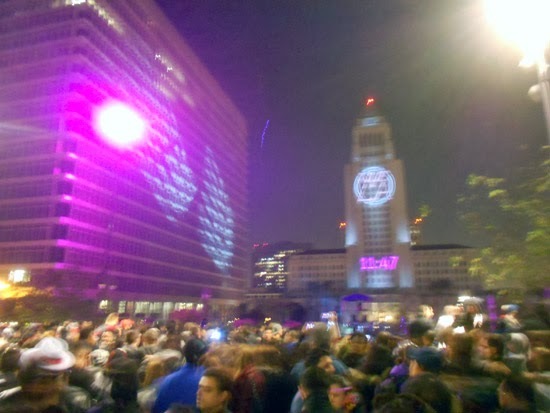 As The Moment Of Truth approached, the crowd headed towards City Hall for the highly-anticipated 3D display show, projected on the west face of our city's 1928 municipal center (Were the crumbling, twisted images of City Hall a political statement of some sort? Makes ya wonder...). When the crowd counted down to one, The Militant made a conscious decision to not make any video recording of it, but rather savor it with his own eyes (Surely at least 12,000 of you recorded and uploaded your own countdown videos on to YouTube, right?). And then all of Los Angeles counted down to Twenty Fourteen. 1. The 3-D projection was awesome! Everyone was enthralled with it, but we all sort of got lost in the visuals for a while and...OH BTW WE GOT 10 SECONDS LEFT TO GO FOR THE YEAR. That kinda came up suddenly on us. Next time, either start counting down early, or give us a visual/audible crescendo that leads us to the main count. 2. Eh, change the font on the time clock. Looks like an oversized cellphone or something. 3. For everyone west of Broadway, we could hardly hear anything. We heard the countdown, people screamed, "Happy New Year!" and we kinda heard...nothing. 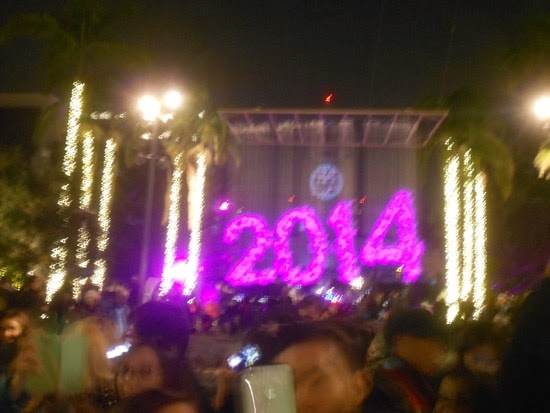 Judging from people's videos, apparently a band played "Auld Lang Syne" after midnight. But The Militant, standing in the Court of Flags, didn't hear nothin'. Maybe put some additional speakers there, and in the other sections of the park. 4. Consider expanding the Party Zone to 1st Street. Then we'll have our OWN "Times Square." Los Angeles Times Mirror Square, that is. 5. Obviously give us different visuals next year. But keep the multilingual "Happy New Year" greetings. That was a nice touch, and no other city in the world can really pull that off. 6. Push the stage up to the City Hall steps and use Spring Street as part of the Party Zone. 7. FIREWORKS. Come on. At the stroke of midnight, we expect to start the new year off with a literal BANG. Your Fourth of July celebration proved that even a small-scale pyrotechnic display can be effective. Don't wuss out on us. Go for the gusto! Let's see fireworks shoot out of the north and south wings of City Hall! Let's see some sparklers shoot out of the Tom Bradley Tower! It doesn't have to last too long. Come on! You can do it! 8. Um, what happened to the Charles Lindbergh Beacon? 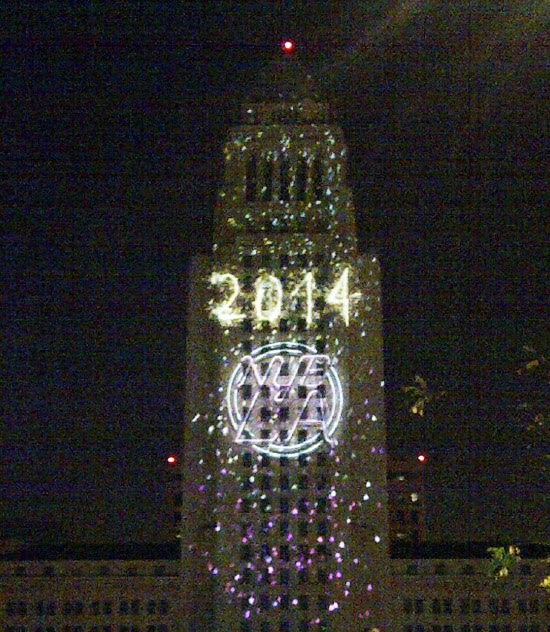 You know, that big white spotlight that rotates around the top of City Hall starting at Christmas and on to New Year's? WHY was it not illuminated last night? Why wasn't it illuminated during this holiday season? Why was it not even turned on once since Eric Garcetti became mayor? Hmmm? THE MILITANT WANTS ANSWERS! Leaving the Lindbergh Beacon off during the holiday season makes Huell Howser's angel cry. 9. FIREWORKS, again. For emphasis. 10. As soon as midnight came, EVERYONE headed for the exits. Subway stations were packed, and traffic jams came up on nearby streets. How about an event that goes on until 1 or 2 a.m. that allows people a window of time for people to leave? 11. Please alert the Little Tokyo bars and restaurants that you have a celebration on New Year's Eve. 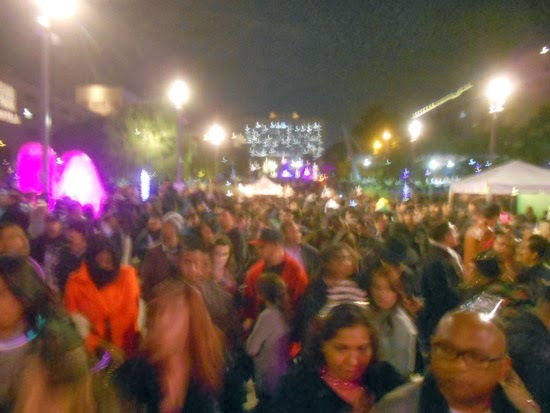 There were several mass exoduses of hungry revelers leaving Grand Park, heading east on 1st Street, only to discover a paltry number of restaurants were open and that they would have to get their first meal of 2014 elsewhere. Tsk, tsk. 12. Did The Militant already mention FIREWORKS? Okay, he's finished with the list. But in all seriousness, thank you and congratulations Music Center, County of Los Angeles and all at Grand Park for putting on the central, public New Year's Eve celebration that Los Angeles has been asking for decades, and the time was right to make it happen. The Militant looks forward to returning in 364 days, and he hopes you address all of his recommendations in some way. 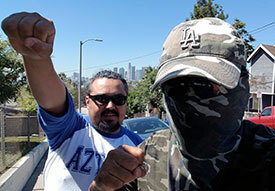 The Militant gives a virtual high-five to all 20 to 30-thousand Angelenos (It's like an entire Staples Center crowd emptied into one place) who came down to be a part of history. And best of all, everyone was happy. Remember, Grand Park is not just a public space. It is a magical energy field. The New Year's celebration can and will only get better with time. Happy New Year, and Stay Militant in da Twenny-One-Fo'! Commandeered by Militant Angeleno @ 10:35 PM 5 comments: Hyperlinks, yo!